From beautifully constructed cribs that grow with your child to cleverly designed modern rocking horses, Kalon Studios continues to wow us. 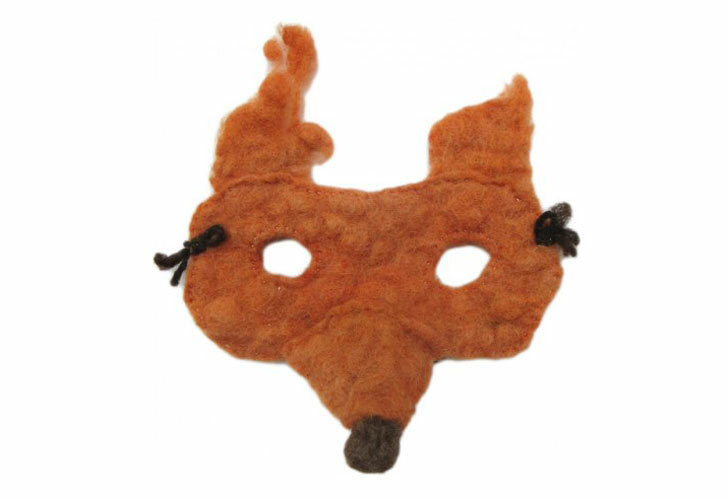 Now, for Halloween, they've introduced a limited quantity of lust-worthy handmade animal masks that can add the perfect finishing touch to this year's costume - and just wait until you find out how they are made! Available in five different styles – owl, fox, coyote, chicken and bear – Kalon Studios Halloween animal masks offer a whimsical, simple, and sustainable way to dress up this year. They are handmade by Amelia McIssac in New York. What’s cool is that she uses wool from her own sheep and gives them color using plant-dyes from her own garden. Depending on the animal mask you choose, dyes may have been created from Indigo, Sunny Red Cosmos, Black Walnut, Brazilwood, Madder, Onion Skins, Golden Rod or Logwood. 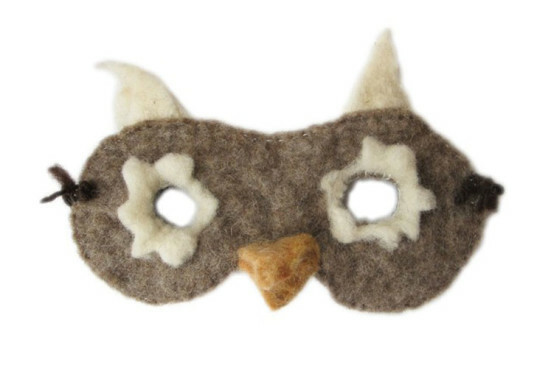 Since these felted wool masks are handmade, they each have an element of individuality, and the one you receive may not look exactly like the ones pictured. With such gorgeous details, these soft and durable masks don’t need much else to make or break your Halloween costume. Just dress up in a similarly colored sweatsuit or leggings and a dress. You may want to add a tail, but for the most part Kalon Studios Halloween masks speak for themselves. Because these masks don’t cover the full face, they are safer than some that may restrict breathing, but always be sure the eye holes are big enough for your child to see properly. These masked are designed to fit both adults and children, and they are equipped with wool yarn ties to adjust them to fit. Available in five different styles - owl, fox, coyote, chicken and bear - Kalon Studios Halloween animal masks offer a whimsical, simple, and sustainable way to dress up this year. They are handmade by Amelia McIssac in New York. What's cool is that she uses wool from her own sheep and gives them color using plant-dyes from her own garden. epending on the animal mask you choose, dyes may have been created from Indigo, Sunny Red Cosmos, Black Walnut, Brazilwood, Madder, Onion Skins, Logwood, or in the case of the yellow bear, Golden Rod. Since these felted wool masks are handmade, they each have an element of individuality, and the one you receive may not look exactly like the ones pictured. With such gorgeous details, these soft and durable masks don't need much else to make or break your Halloween costume. Just dress up in a similarly colored sweatsuit or leggings and a dress. You may want to add a tail, but for the most part Kalon Studios Halloween masks speak for themselves. Because these masks don't cover the full face, they are safer than some that may restrict breathing, but always be sure the eye holes are big enough for your child to see properly. These masked are designed to fit both adults and children, and they are equipped with wool yarn ties to adjust them to fit.